You might remember a few months back I wrote about RetroBots, little plastic vending machine robot figures that have turned up over the past couple years. Well, Bill Murphy, founder of Fresh Monkey Fiction, tipped me off to some really cool things they're doing with RetroBots that I wanted to share. First, FMF is using the bots to raise relief funds for those affected by the Oklahoma tornado disaster that struck on May 21st. 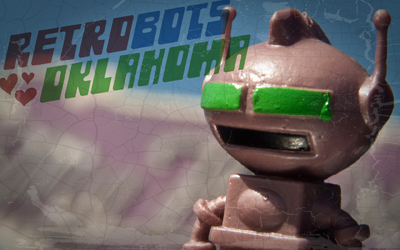 Starting May 23rd, the site began offering a RetroBots downloadable desktop wallpaper for $1, with 100% of the proceeds being split between the Red Cross Disaster Relief Fund and United Way of Central Oklahoma. The wallpaper, shown at the top of this post, features a shot by photographer Danny Neumann. 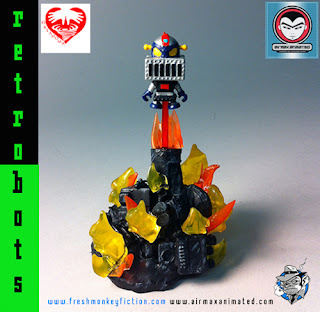 Those who make a donation up until July 31st will be automatically entered to win the custom RetroBots figure by Airmax Animated shown to the right, or if you made a donation to a charity directly you can forward the confirmation to freshmonkeyfiction@gmail.com to be entered to win. Additionally, FMF is running a series of charity auctions using RetroBots items throughout the year in order to raise funds for The Young Storytellers Foundation, which focuses on developing literacy through storytelling. Each month for the rest of the year will include an auction featuring RetroBots custom figures, art prints and photography. First up will be figures from toy customizer Ersico, up for auction starting June 17th. Take a look at Ersico's RetroBots customs below and keep an eye on FMF's eBay page. Other upcoming auctions will feature contributions from the likes of Cantina Dan, October Toys, Monsterforge and more. Check out FreshMonkeyFiction.com for more on these efforts. Nice work, FMF! *All photos in this article supplied by Fresh Monkey Fiction.